An Anonymous tribute to Shaider and Michael Jackson, who are both dead. This is fake. Looks totally photoshopped. duhhh… of course it’s photoshopped. matinik: Of course it’s fake, dude. Shaider was just a TV show. It was make believe! Also, letters don’t float in the air in real life. 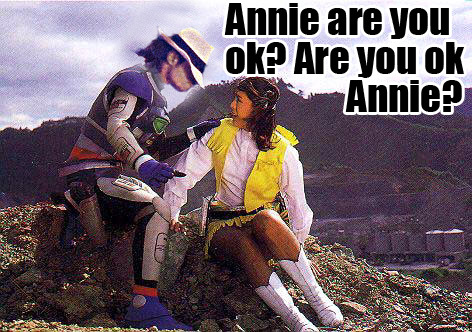 It’s Annie’s costume that brings out the perv in everyone. That’s nonsense. Michael Jackson would only touch underage boys. ha? shaider’s dead too?? oh no. Just saw matinik’s site, it’s called Pinoychan, a manga site. I bet all things are real in his world, nothin’ photoshopped and no floating letters. Damn right, Juancho Bombero. I like to keep it real in my world. I also prefer it to be populated by smart people who can recognize irony, but alas, I have to share oxygen with people like you. Nothing beats a human mimicking spambots. It’s a new anti-spam policy against spammers who get past our defenses. We’ll approve the comment, but hijack it.